Earlier this year, Surfrider members from across the U.S. visited Washington D.C. to ask members of Congress to protect the Atlantic from oil and gas development. Now, two of these federal leaders - Senator Cory Booker and Senator Bob Menendez, both from New Jersey - have introduced a bill that would ban seismic testing to locate offshore oil deposits off the East Coast. The proposed legislation would prevent the Bureau of Ocean Energy Management (BOEM) from issuing permits to oil companies seeking to conduct seismic surveys, a practice that could have devastating impacts on the Atlantic coast's economy and threaten endangered species populations. Support for the Atlantic Seismic Airgun Protection Act is a key part of Surfrider's Protect the Atlantic campaign. In March, the federal government announced that it would protect the Atlantic coast from offshore oil drilling in the 2017 - 2022 leasing plan. However, BOEM still plans to allow seismic testing for oil and gas in the Atlantic in anticipation of drilling in the longer term. Such testing would not only set the stage for oll rigs in the Atlantic after 2023, but would also cause major impacts to marine wildlife in the shorter term. According to the Department of Interior’s own estimates, seismic exploration in the Atlantic could injure up to 130,000 marine mammals over the next eight years, including the critically endangered Right Whale and the bottlenose dolphin. The noise from surveys would also disrupt millions of other mammals and sea turtles by interfering with mating, communication, and migration activities. Finally, seismic surveys would displace and cause impacts - such as temporary hearing loss - to a broad range of fish and invertebrate populations. 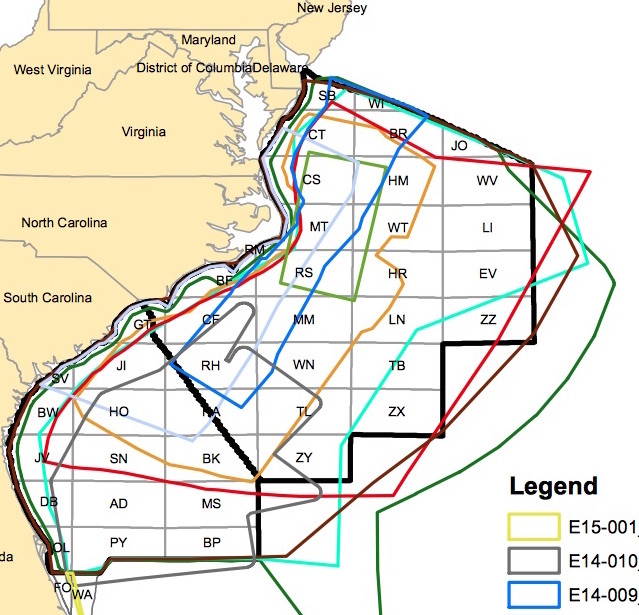 The Bureau of Ocean Energy Management has released a map (see graphic) showing where companies want to conduct seismic surveys for oil and gas off the Atlantic coast. The permit applications span from Delaware to Florida and target seismic testing from close to shore to over 500 miles out. While some of the applications have been withdrawn since the release of the Proposed Plan, many others are still pending. To demonstrate opposition to seismic testing in the Atlantic, Surfrider chapters are organizing Hands Across the Sand events on May 21st. The event brings people together to oppose new offshore drilling and other fossil fuel development and promote a clean energy future. At noon local time, participants will join hands for 15 minutes on beaches and parks around the world to demonstrate support for protecting our coasts from oil and gas development and the need to transition to clean energy solutions. All events are organized locally by volunteers and the event website provides most of the resources that you will need. The next few weeks are a crucial time to make your voice heard on the issue of seismic testing in the Atlantic Ocean. See below for more information on how to express your views to decision makers.